Resonance CLPD has once again added one more Star to its Glory as one of our student, GIRISH NAGAR (Reso Roll No - 12811680), had been awarded by ICSI with Past President Chinubhai R. Shah's SILVER MEDAL for securing Highest Marks (77 out of 100) in 'Drafting, Appearances and Pleadings' paper held in CS-Professional (Dec-2014) Exam at All India Level. Past President Chinubhai R. Shah's Silver Medal is being Awarded to a candidate who passes in all papers of the Final / Professional Examination of Company Secretaries (CS), at first attempt, in one sitting, without claiming exemption in any subject and obtaining the highest marks in 'Drafting, Appearances and Pleadings' Paper under New Syllabus OR in 'Secretarial Practice Relating to Economic Laws and Drafting & Conveyancing' Paper under Old Syllabus, whichever is higher, taking into account the performance of all successful candidates. 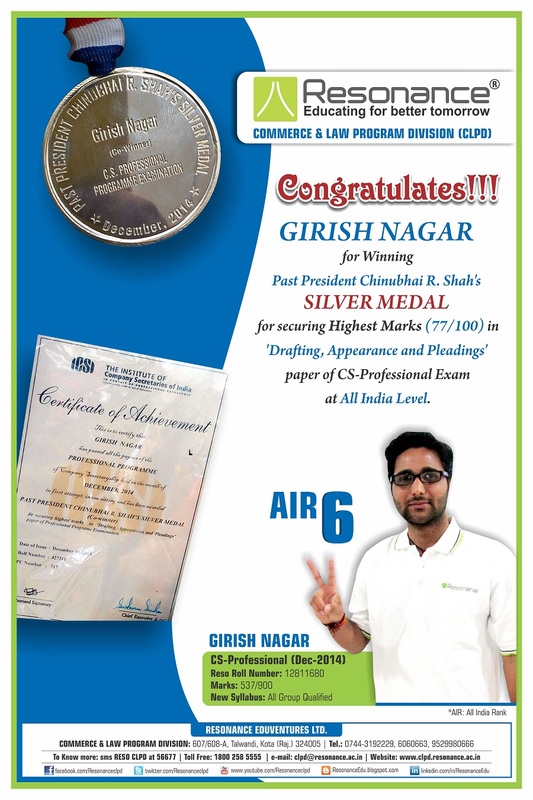 It is a proud moment for us, that our student, Girish Nagar, who after excelling in CS-Professional (Dec-2014) exam with All India Rank (AIR) - 6 has now been honoured with Past president Chinubhai R. Shah's Silver Medal for securing Highest Marks in 'Drafting, Appearances and Pleadings' paper of CS Professional Exam. Mr. R.K Verma (MD, Resonance) appreciated the hard work and efforts made by the student as well as Resonance faculty team towards this achievement and extended heartiest congratulations to Girish Nagar for this proud moment.